On December 28, Egypt’s Ministry of the Interior said an improvised explosive device (IED) attack on a tour bus in the Haram neighborhood of Giza killed three Vietnamese tourists and an Egyptian tour director. A January update from the Egyptian military spokesman on counter-terrorism efforts ambiguously signaled the end of Operation Sinai 2018, when a report on operations made no mention of the nearly year-long campaign. 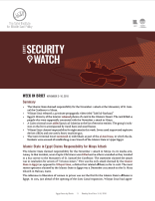 Twenty-six terrorist attacks have been reported since December 17 (the date of the last Egypt Security Watch brief) across Egypt. The interior ministry has reportedly conducted at least seven counter-terror raids over the reporting period, including one December 29 raid, which killed 40 suspected militants. The Egyptian military spokesman released a video updating a now-unnamed nationwide counterterrorism campaign. The update said that the army had destroyed 56 vehicles, disarmed 242 IEDs, and killed 59 militants. The video acknowledged seven Egyptian military casualties. The update was presented in a similar fashion as the 30 announcements detailing Operation Sinai 2018’s developments, but did not formally describe that operation’s status for 2019. Operation Sinai 2018 was announced after the November Rawda mosque attack and launched in February 2018 with the stated objective of “clearing areas where there are terrorist hotbeds, and to fortify Egyptian society from the evils of terrorism and extremism in parallel with other crimes affecting security and internal stability.” The 30 official statements chronicling the operation have totaled 465 suspected militants killed and another 5,262 arrested. A tour bus was damaged by an IED on December 28. Three Vietnamese tourists and their Egyptian tour director were killed, and ten more tourists wounded. The attack represents just the fifth attack of 2018 to be reported outside Egypt’s North Sinai province and the fifth operation to target Egypt’s tourism sector since 2015. No group has claimed the attack to date. The following day, security forces announced that they had killed 40 suspected militants in two operations in Giza in apparent retaliation for the incident. On January 4, the families of Ahmed Yusry and Ibrahim Abu Soleiman were notified that the two men had been killed as part of the operation, and their bodies had been transferred to the morgue. The families of both men claim that the two had been forcibly disappeared before the counter-terror operations took place. Over the reporting period, which spans from December 18 to January 24, 26 terror attacks were reported in Egypt. In addition to the attack on the bus of Vietnamese tourists in Giza, 25 incidents occurred in North Sinai. Wilayat Sinai—the Islamic State’s “Sinai Province”—claimed responsibility for 25 attacks in North Sinai, while one incident in the province remained unclaimed. Of the attacks claimed by Wilayat Sinai, 22 operations targeted military assets in Rafah (15 of the attacks) and Sheikh Zuweid (seven). The remaining incident was an IED attack on a military bulldozer near Arish. In operations claimed by Wilayat Sinai, 16 attacks used IEDs. Five others involved snipers, and there was one report of a rocket-propelled grenade (RPG) being used to destroy an Egyptian tank. In the one unclaimed attack, a roadside IED killed a police conscript and wounded four others. In 2018, approximately 55 percent of terror operations in North Sinai went unclaimed. At least 73 suspected militants have been killed and 22 arrested over seven counter-terror raids in the reporting period. The reports did not specify the alleged organizational affiliation of the raid’s targets, but three operations took place in North Sinai, where Wilayat Sinai operates. The four raids which occurred outside of North Sinai province were all announced by the Ministry of Interior’s Facebook page. The two North Sinai reports came from the Associated Press and cited unnamed security sources. This is consistent with the ongoing media blackout in North Sinai, which began in 2014. Issa al-Sabbagh and Mahmoud Abdelaziz were briefly detained and later deported after facing accusations of involvement with a terrorist organization. Both men, whose cases appear to be separate, are Egyptian-German, and were traveling to Egypt to visit family. Abdelaziz is studying at the Islamic University of Medina; the German outlet Südwestrundfunk claimed he was known to German authorities as a suspected extremist. Various media sources reported that Sabbagh possessed maps of North Sinai at the time of his arrest. Wilayat Sinai released a statement saying that Israeli warplanes conducted airstrikes in North Sinai. Israeli-Egyptian cooperation in North Sinai has been well established, with reputable reporting on Israeli involvement in counter-terror operations. In a 60 Minutes interview, Egyptian President Abdel-Fattah El Sisi acknowledged cooperation with Israel but did not comment specifically on use of Israeli airpower in Sinai.